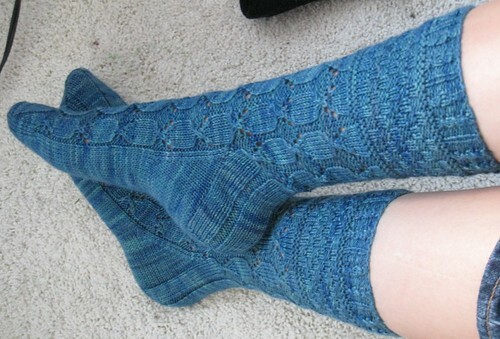 Looky, I'm off to a great start with my sock resolution: I finished a pair already. Granted, I started them back in October, but still, they're finally done. This is Through the Loops' Socktober 2010 Mystery Sock. 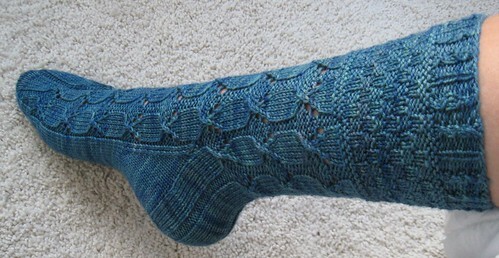 I love doing these mystery sock-alongs, where a snippet of the pattern is posted each week. Unfortunately I usually finish the first sock in October/November, and then don't get the second one done until January. This happened for the 2009 sock as well. Sometimes I wish a knew a one-legged person. Or one-footed person. But then I remember that's a horrible fate to wish upon anyone just for the sake of knitting fewer socks. The yarn, some of you may have already guessed, is Skinny Buggy in Blue-Arsed Fly. What a fantastic name. There just aren't enough colorways with the word "arse" in them. I seem to have inadvertently knit one toe longer than the other. 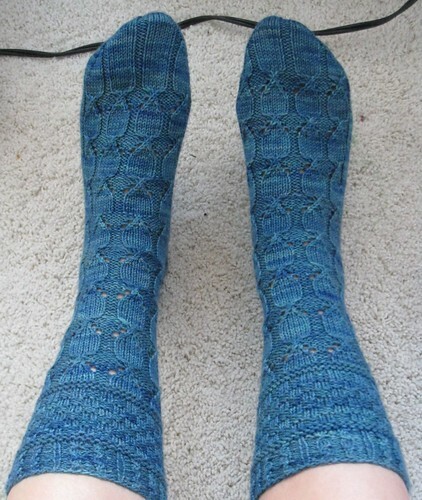 The socks are the same length, but I carried on with the foot pattern about a half-inch more in one sock than the other. I swear I followed the directions for BOTH socks, but clearly I didn't. I really hope no one stares at my toes enough to notice this.